How do you pick the right carpet cleaning professional for you and your family? There are many textile cleaning services out there, with many claiming "new" and "revolutionary" cleaning methods, magic chemicals and various and assorted other bits of cleaning voodoo. How often have you tried these options only to be disappointed with basic service issues? There are a variety of methodologies out there, and we discuss them in some detail on this website, but the truth of the matter is your satisfaction with a textile cleaning service will always come down to how you feel about the service experience. Does equipment matter? Does education and experience matter? Does adherence to The Principles Of Cleaning matter? Yes, to all three questions. However, the most important thing by far is the commitment of the carpet cleaning technician and company to your satisfaction. At Pro Care Cleaning we are passionately committed to delivering an outstanding service experience to you. Our promise to you is that we will arrive on time, be professional in our appearance and service delivery, and show respect for your home and furnishings. VERY personable and caring staff. The carpet is cleaner than anytime in the 3 years we have owned our home. Both the estimator and the cleaning staff were on time. 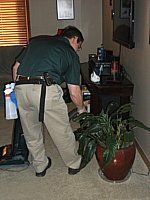 The very first step at Pro Care Cleaning is for us to come out to your home and give you an estimate. This process usually takes no longer than fifteen minutes, but can take longer if you have questions or concerns for us to address. We'll measure out the areas to be cleaned, take a look at any problem areas, and give you an idea as to the improvement that can be made. Once we have all the information we need, we'll quote you a firm price. At Pro Care Cleaning the price does not change once the job is underway. No extra charges for deodorizer, for treating problem areas, for moving the couch, etc. The price is the price and you can rely on not having an unpleasant surprise at the end of the job. Pro Care - Real Life Photos! 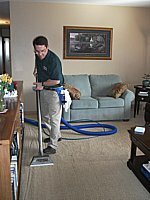 The first step in proper carpet cleaning is always to vacuum. When we vacuum, we edge everywhere, moving couches, end tables and coffee tables to vacuum underneath. A good thorough vacuuming is very important. It not only removes dry particulate soil, but it always shows us where we need to pre-treat spots. Your staff were very cordial. They did not push to do more than I wanted. I was impressed. The carpet was beautiful. The staff - I felt comfortable having them in my home. They were very knowledgeable. While we are in the process of vacuuming we will pre-treat spots as we come across them. What kinds of spots need to be pre-treated? Any organic stains, like food stains and pet accidents, need to be pre-treated. Also, inorganic stains from artificial dyes need pre-treatment. There are a wide variety of oxidizers, reducing agents and specialty spotters we have available to us to deal with any kind of spotting or staining challenge. Not all stains can be removed, but we will make every effort to mitigate any problem areas to the greatest extent possible. Treating the carpet with a specially designed pre-spray starts to suspend and separate the ground in soil. This step, in combination with the next step, is really what determines whether a carpet cleaning is effective at removing the maximum amount of soiling. Many carpet cleaning companies skip this step and the following step, instead running high ph detergents through thier solution line in order to save time. This, of course, leads to a carpet full of residue that re-soils quickly. 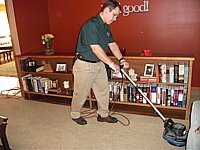 A professional carpet cleaning company, following the IICRC guidelines, will always utilize a pre-spray. Cleaning this way allows the carpet cleaner to truly rinse the carpet with the Truckmount, since the "heavy lifting" has already been accomplished by the pre-spray. The end result is soft, clean carpet! Agitation, manual or mechanical, is the next step. 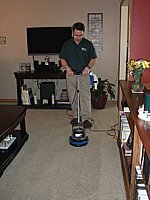 Agitation of the pre-spray allows for even dispersal into the face fibers of the carpet. It also helps to loosen any soil that is "stuck" to the carpet fiber, usually because of some stickiness associated with the particulate. Once this step is complete, the hard work of cleaning has been accomplished! Dwell time is the only step we don't have to work hard at! From the first application of pre-spray to the point where we begin rinsing and extraction, a certain amount of time needs to expire to allow the pre-spray to do it's work thoroughly. Ten to fifteen minutes is acceptable. In most cases our pre-spray enjoys a dwell time of twenty minutes or more. Now it's time to extract! This is the point where we get to rinse out all the gunk we've suspended in the carpet. Because we've followed the IICRC cleaning guidelines, this step is truly a rinsing and extracting step. We can rinse with soft water, leaving as little residue as humanly possible. The end result is a carpet with a soft "hand", increased vibrancy in color and texture - a carpet that looks and feels alive again! Now is the time for any post-cleaning applications, like carpet protector. Grooming the carpet aids in evaporation, and uniform dispersal of any post-cleaning applications. Drying of freshly cleaned carpet should normally take six to eight hours, not to exceed twenty four hours. Many factors affect dry times, from weather and ambient humidity to the use of HVAC systems, ceiling fans and/or axial fans and blowers. At Pro Care Cleaning we make every effort to expedite drying times.